Trojan was one of many companies making plastic toy soldiers during the 1960s, mostly in the classic 1/35th scale or there abouts. However they did produce a handful of figures in what they termed their 'Tiny Trojans' series, which were in 1/72nd scale. One such set was of railway figures, but there were also two military sets, which we will examine in this article. Both the military sets consisted of just four poses, representing 'khaki infantry', which might be assumed to be generic British Infantry of World War II era or the years that followed. However not much is known about these figures. They may have been an answer to the Britain's Lilliput figures which have been recently released by A Call To Arms, but that first appeared towards the end of the 1950s. Alternatively they could have simply been aimed at Sky-birds or model railway enthusiasts. They were factory painted and mostly copies of figures produced by Crescent. They predate the similar Airfix set, and are therefore some of the oldest figures on our site, but it shows in the quality. The figures have no more than a basic human form, with very little detail anywhere. The clothing almost looks like a one-piece body suit, while hands and faces are largely featureless blobs. The very pronounced ridge round the mould seam further detracts from the look of these figures, while the cursory and therefore cheap painting seems to make matters worse. Weapons too are largely just sticks painted black, although whether small boys of the time cared too much, or simply used their imagination to fill in the blanks, is not recorded. The figures are presumably wearing British battledress and some generic helmet, but otherwise largely defy any in depth examination of accuracy. The bright green respirator on each man’s chest is an interesting feature, but hardly appropriate for most of the Second World War or thereafter, and is perhaps provided in lieu of the missing ammunition pouches - one thing to paint instead of two. The first figure is clearly holding a grenade, and the middle two are riflemen, but the prone figure, which does not appear to have Crescent origins, is a bit more mysterious. The short black doubly-barrelled weapon in his hands resists all attempts to even guess at an identity, but logic would suggest it is intended to be a machine gun of some sort. The second set has much the same characteristics as the first, with very poor sculpting and a very crude look. This time we find two firing poses followed by an exciting but highly unlikely pose of a man bayoneting someone from above. The fourth holds some sort of bazooka, but as with everything else is entirely without any detail. The first three figures seem to be derived from old Crescent moulds for lead figures, and may even have used the same moulds. 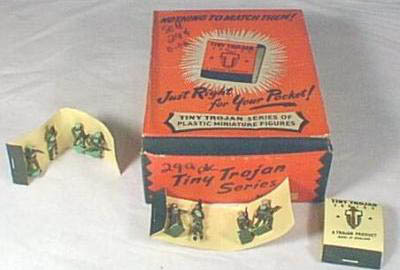 Tiny Trojan sets were packaged in book match covers with the slogan 'Nothing to Match Them! ', and at the time the competition was indeed pretty limited. 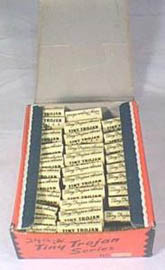 The first photo above shows the military figures in their packaging, while the second shows the counter display box from which they were sold to many a small boy. Today these figures are rare and only of interest to collectors, but serve to remind us of how far the hobby has come in the decades since this toy first saw the light of day. Plastic Soldier Review would like to express their thanks to Hugh Walter for his invaluable help in preparing this article. Visit Hugh's Small Scale World blog. We must also thank Victor Rudik for supplying the photos of the packaging.